Late last month, Kessil finally unveiled a bit of information on their latest LED light fixtures for aquarium use, the A350 and A30w. 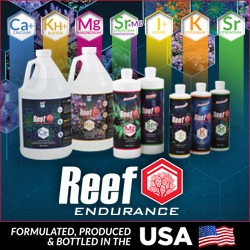 MarineDepot, have already gotten their hands on the yet to be release pendants and posted quite the detailed entry on their blog recently in which one of their staffers unboxed a pair of the the brand new Kessil A350 Tuna Blue LEDs and suspended them over an Acro dominated reef tank. The new A350 is quite an impressive fixture, and as detailed below, it looks to provide great color and a more than adequate light spread. 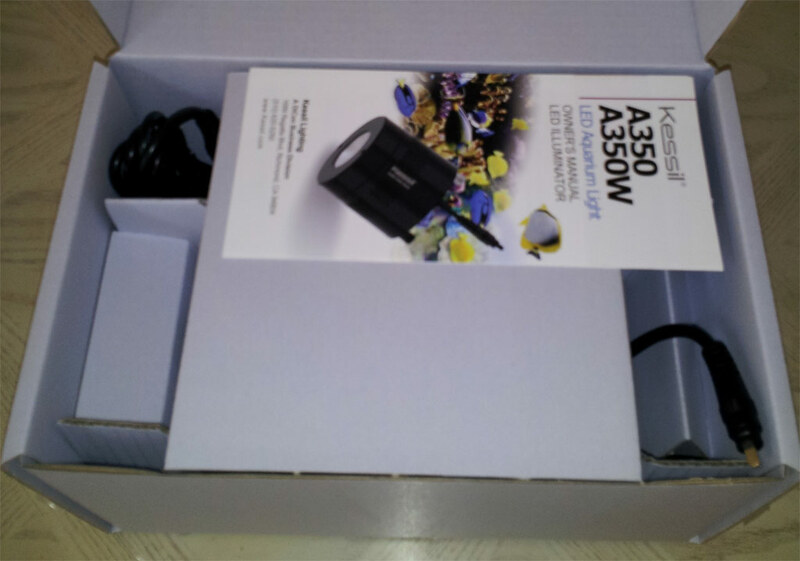 The packaging seemed quite efficient from the photographs, as did the small housing of the fixture itself. 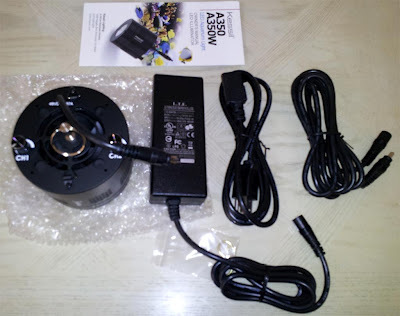 The blogger reports that the cooling system and fan are very quiet and that the fixture is cool to the touch. They also report there is virtually no “disco effect” or color banding commonly associated with LED’s. This is most likely due to the point source of light that the various smaller diodes in the multichip combine into, much like the Ecoxotic Cannon pendants. 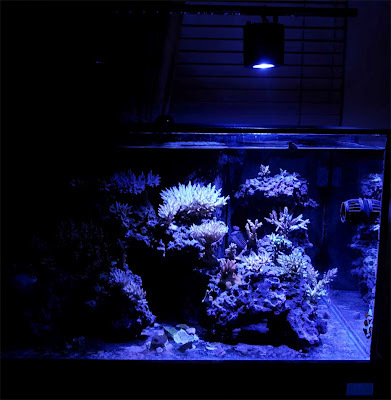 The author has their Kessil’s mounted on a light rail hanging above the tank, but mentions that there are multiple ways to attach the fixture, including a gooseneck clamp which is currently in the works and popular with the Kessil A150 pendants. Another awesome feature of this light is that the power cord measured was almost 20 feet in length. This would allow placement virtually anywhere and is especially important for those planning to hang the fixtures. When the Kessils are mounted 8 inches above the water line, I was only able to get a 20 inch light spread. Two A350s on a 4 ft long aquarium would have some shadowing in the corners. The Kessil A350W (Wide Lens) would be a better choice as they would easily cover a 24+ inch light spread. 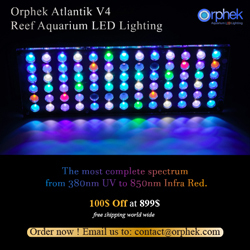 This is pretty good light spread for a fixture with narrow optics designed for deeper reef tanks. The Kessil is currently hanging over some nice SPS, and we are eager to hear an update on the corals responses in the coming week. Via Marine Depot Blog. Also be sure to check out the MarineDepot video of the Kessil A350s in action. Thank you so much for sharing, Louis! Thank you for sharing! Our staffer is really happy with the performance and general look of the lights. He has had to get used to the change from T5 to LED, and is currently running them at 30% intensity to prevent burning his coral. Hopefully he’ll keep us posted on how they do with growth! How are the SPS doing under this light?